Discard all R Energy cards attached to Blaine's Charizard except 1. 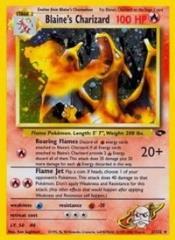 If all Energy cards attached to Blaine's Charizard provide 2 R Energy, discard all of them. This attack does 20 damage plus 20 more damage for each R Energy discard in this way.